Sunday Post is a weekly feature hosted by Kimba the Caffeinated Reviewer. It's main purpose is similar to that of a Sunday newspaper; recap of the week gone by, additions to your library and what is going on in the book blogging community. Welcome to my Sunday Post of the fortnight, as some may have noticed I do a Sunday Post every 2nd Sunday rather than every Sunday, I just don't buy enough books to do a weekly haul post. This week however, I've had PLENTY of books come in but I haven't had the chance to take pics of my big haul so I will just leave it for either next week or the following fortnight. I'm just curious, do you all do a Stacking of the Shelves/In My Mailbox and Sunday Post weekly? Are some Sunday posts shorter than others? For the bloggers that use Blogger, do you use the default comment app? I can't seem to get the threaded comments working for my blog so I decided to trial Disqus for a week. It kept using my profile pic despite the comments coming from others, so I removed it and it removed all my comments during the time I was trialing it! I'm researching into alternatives and contacted Blogger to try and get my threaded comments working as that's all I want from Disqus anyway. So I'd like to know, Blogger users, what do you use for your comments? How are you finding that? Badass Bookie had an event where she featured 2013 Debutantes (debuting Authors). It's such an awesome feature which is in it's third year running with awesome giveaways and I won Dualed by Elsie Chapman. Thank you Lisa! These are just my buys. Enthralled is actually a compilation of different YA Paranormal Authors with Kami Garcia (Beautiful Creatures), Rachel Vincent (Soul Screamer Series), Ally Condie (Matched Trilogy), Rachel Caine (The Morganville Vampires) just to name a few of the included Authors. It's actually a short-story book, so each short story is written by one Author. The Sky is Everywhere is a book I've had on my wishlist for awhile and I was so lucky to found it at my local "discount" book stall, and I cannot believe at how pretty the cover is! It comes with a little ribbon to close it like a journal. These are the non-fictions I've bought. The Happiness Project by Gretchen Rubin. There is also an included journal to accompany this book and Kikki-K stationery store here in Australia also have workshops. Check out the links provided if your interested. Spring Blog Carnival is an annual event that is in it's third year running. 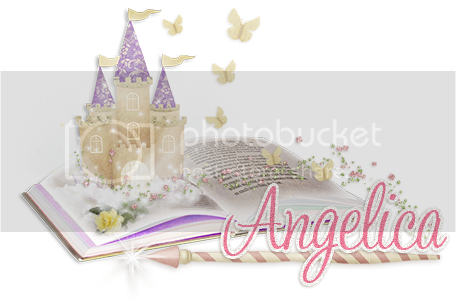 It is created and organised by some amazing book bloggers: Lori at Pure Imagination, Candace at Candace's Book Blog and Angela at Reading Angel. The Spring Blog Carnival is a virtual Carnival for book bloggers, each blog participating is a "booth". So as not to wreck this AWESOME event with a crappy explanation of how it runs, please click on the button above for a better and more comprehensive explanation of this event. Sign ups for booths are currently taking place, it's a first idea, first come basis so hurry if you've got an idea for a booth! Last but not least...Paperback Princess is going to be holding a booth at this year's Spring Blog Carnival!!! The preparations for my booth is currently underway and I hope you all enjoy the booth I'll be presenting! I was not able to participate in Kimba the Caffeinated Reviewer's Take Control of our TBR piles event held for the entire month of March, sign ups are still open, unfortunately for me I've over committed myself to blog tours so unable to actually read books in my "TBR" pile. Anyway, so for those that missed out like myself Kimba is hosting another event in May! Click on the button above to sign up now. The Book Monsters is hosting two Read-a-thons corresponding with each other. You can join one or both, click on the button above to sign up! 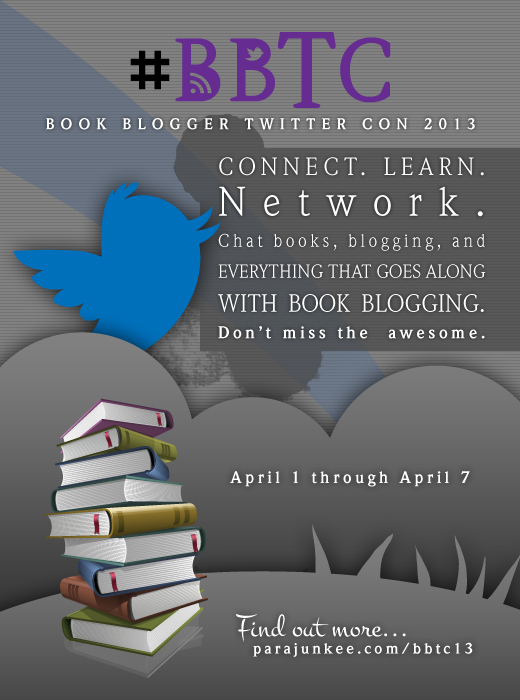 The First EVER Twitter based Book Blogger Conference. Click on the button below for more info or click here to vote for your favourite nominated bloggers. WOW. Lots going on huh? :) There is a lot of fun stuff I wish to participate in but I am going to be out of town visiting my family! I do Stacking the Shelves once a month, usually the last Saturday. Thanks for stoppin by and I hope you have a good week! WoW you had a crazy week! Thanks for stopping by. Can't wait to see what you think of Dualed, I have been lusting over it. I'v been dying to read Dualed and Etiquette! I hope you enjoy all those great books and have a fantastic week! Wow, very hectic couple of weeks there! Nice haul, hope you have better luck with Etiquette & Espionage than I did, I couldn't finish it. Hope you enjoy your newest book acquisition...look forward to hearing about the others you've gotten recently. Thanks for visiting my blog...have a great week! wow this post has a ton of great stuff!! Have to say that Insurgent is amazing <3 (I always have to mention divergent books if they appear at any post!) I might actually sign up for that tbr pile event in may too!! You have had a wonderful week and received some amazing books. Enjoy your week ahead. Thanks for stopping by. I do my Sunday Post every week, and I find that compared to the other memes you listed it helps recap the whole week at once. But yeah, my Sunday Posts fluctuate in length. Sometimes I have a ton to update and other times it's only a few posts. I hope you enjoy Dualed and your other books! Wow! A blogger twitter conference, I had no idea thanks for sharing! I am all signed up for the Carnival, I participated last year and had so much fun. I hope you got a spot as well. I am doing the Food Booth. Thanks so much for visiting my blog, Angelica. Hope you have a wonderful week. Wow, you've been busy! That's a lot of work. I'm reading Etiquette and Espionage now and liking it so far. You are super busy! Wow! Hope you have a great week! Wow thank you for all this information - I didn't know about the Spring Blog Carnival and had actually forgotten about the Twitter Con... will have to write down the dates so I don't miss them! 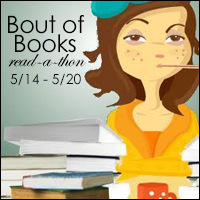 :-) You have some great books this week too - I really want to read Dualed! In terms of comments, I'm not actually sure how I got the comments to thread properly on mine. They didn't work at first, but when I changed to a different design they just started working. I use the Blogger 'Travel Template' now, if that helps. Looks like you will be super busy again!! Nice haul!! hope you enjoy them! PS My sister made my pointer, I love it too!! Thank you for stopping by The Bookwyrm's Hoard on Sunday!